What’s the Deal with Precession? First, let’s explain the zodiac. Now imagine you’re an ant on the surface of the apple, and imagine we could temporarily turn the sun’s light off. What you’ll see are the walls of the room. In space, there are no walls, but there are stars, which are far enough away that they can be considered stationary relative to the earth. However, as the Earth spins, the stars will appear to rotate around the point that lines up with the Earth’s axis, which you can now visualize as a laser beam shooting out of the top of the pencil. It so happens that there’s a star there; Polaris, the North Star. From the point of view of the ant, all the stars are rotating around Polaris, which stays in the same place. At time 1, both the sun and a distant star appear to be directly overhead. At time 2 (one sidereal day later) the distant star is again directly overhead, but the sun is not. 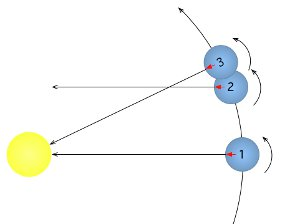 At time 3 (one solar day after time 1) the sun is again directly overhead, but the distant star is not. Incidentally, this whole optical illusion of the nearby sun appearing to be in a different position relative to the far-away stars is called parallax. It’s the same illusion you use when you pretend to squish the heads of distant people with your fingers. Anyway, the very slight mismatch between the sidereal day and a solar day means that the sun isn’t quite in sync with its celestial backdrop. Over the course of the year, it appears to move in a slow circle in relation to the stars. Astronomers call this circle an ecliptic. Several thousand years ago, the Babylonians divided up the ecliptic into twelve pieces, each named after the closest constellation. Whichever of these twelve pieces the sun was “in” when you were born is your star sign. Note that you can’t actually see your constellation during the month you were born; since it’s “behind” the sun, it’s only out during the day, when we can’t see the stars. Now for the precession part. To go back to the top analogy; as the top slows down, it starts to wobble; the axis doesn’t always point in the same direction, like this gyroscope. This is called precession. The wobble of the earth is caused by gravity. This is a bit complicated, but basically the earth’s spin means it isn’t perfectly spherical; it bulges at the equator. The gravity of the sun and moon pull on this bulge, causing the axis to precess in a slow circle, completing one revolution every 26,000 years. This has all kinds of implications. For one, it changes the North Star. Polaris isn’t exactly lined up with the axis, it’s just the star that happens to be the closest right now. In the year 3000, Gamma Cephei will be closer, and 1200 years after that, the closest will be Iota Cephei. It’s equally true of the past as well; for the ancient Egyptians, the best North Star was Vega, and 12,000 years from now, it will be the closest again. Of course, “in” is a relative term; because of the non-uniform shapes of the constellations, the sun spends much more time in some than others, so it’s a bit arbitrary to decide that it moves from one to another 12 times a year. Alternate systems have been proposed throughout history, but the idea that we should add Ophiuchus as a 13th seems to originate with a guy called Stephen Schmidt, who wrote a book called Astrology 14 in 1970 (he also advocated adding Cetus, the whale). The idea proved quite popular among sidereal astrologers, particularly in Japan. The thing is, there is no international body governing astrologers in the same way that the International Astronomical Union does for astronomers. Even if there was, I have a funny feeling that all kinds of variations on the same general theme will be popping up as long as people continue to put their faith (and money) in astrologers.